For-Bro Engineers offers Grease filler for filling black/White Grease, Adhesive, Balm, Paste, Gel in pre-formed pouches/Jar/Tubes. Grease filling Machines are available in a variety of models to suit client requirements and the pack sizes starting from 5gms to 1000gms with an accuracy of +/-1%. Grease/paste into the output nozzle and facilitate the flowability of the product thus increasing the accuracy. Auger screw are chemically treated to ensure that it can withstand product with high abrasion characteristics. The Optional arrangement is provided to lift the bottle/container under the nozzle of the machine and facilitate the bottoms up filling which ensures that the product is evenly filled into the container without overflowing. 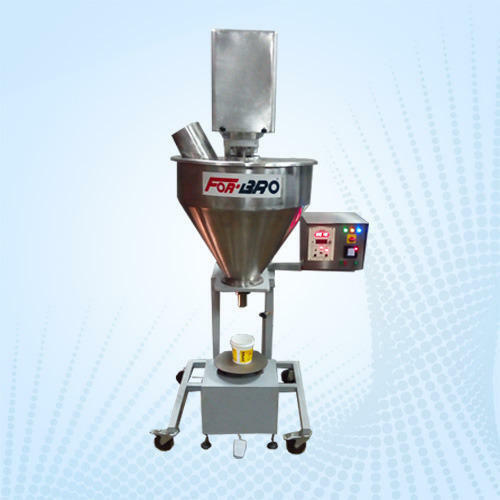 Machine can be provided with the extended chute for replenishing the product in main hopper. Multi-head automatic filling with conveyorised container feeding can also be provided.